Benjamin Ferencz, Raphael Lemkin, Luis Moreno-Ocampo et al. With his provocative question, “why is the killing of a million a lesser crime than the killing of an individual?” Raphael Lemkin changed the course of history. An extraordinary testament to one man’s perseverance, the Sundance award-winning film Watchers of the Sky examines the life and legacy of the Polish-Jewish lawyer and linguist who coined the term genocide. Before Lemkin, the notion of accountability for war crimes was virtually non-existent. After experiencing the barbarity of the Holocaust firsthand, he devoted his life to convincing the international community that there must be legal retribution for mass atrocities targeted at minorities. An impassioned visionary, Lemkin confronted world apathy in a tireless battle for justice, setting the stage for the Nuremberg trails and the creation of the International Criminal Court. 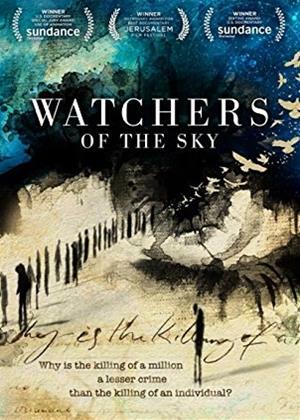 The title of Watchers of the Sky refers to a man who once studied the skies for 25 years tracking the movement of stars. When asked what good any of this knowledge would be, he admitted he did not know, but that he probably saved somebody else 25 years of work. It’s a similar path of work for the many who speak out and do their best to stop international crisis of genocide. In a world of constant intolerance that results in violent massacre after massacre, calling the war on genocide an uphill battle would be an understatement. These brave men and women who dare to speak out against these atrocities may not be the most successful in their goals, but they’re hopeful they can leave even the smallest of dents for others to continue their work. As discussed in this documentary, the term genocide itself originated in the 20th century by Polish lawyer Raphael Lemkin. After much consideration in the wake of the Holocaust, he arrived at a proper name for the worst crime against humanity. He decided on genocide based on the Greek word “genos” for race/people and “cide” for kill. From that simple enough definition, he helped lobby and craft the United Nation’s Convention on the Prevention and Punishment of the Crime of Genocide (rolls right off the tongue, doesn’t it?). With this adopted resolution, Lemkin hoped that he could prevent another Holocaust. Even as international law, the killing of hundreds still continues. This is where our current day heroes step in to continue Lemkin’s work. Samantha Powers, the current United States Ambassador at the UN, relays her experience as a journalist in the Yugoslav Wars of the 1990’s. It was an era of horrific violence where vicious soldiers would round up the males of a town they invaded and gun them down one by one. So frequent were these slaughters that Powers notes how her editor grew weary of which stories to cover in the area. It’s rather shocking when one of the most brutal acts of genocide for that decade is treated as business as usual for that region. Wars should not be such a casual occurrence that force editors to decide if the latest killings should be on page eight or no pages at all. Benjamin B. Ferencz is seen as both the prosecutor during the Nuremberg trials and the spry advocate against genocide at the United Nations. It’s amazing to hear his thoughts on those days of trying Nazi war crimes, but it’s inspiring to see him continue the fight with a hopeful heart. He cheerfully strolls into the United Nations, chatting up ambassadors and passing out informational documents (in addition to candy). At 95 years old, he doesn’t seem very deterred or weary from his goal. He’s very familiar with the tale of the man who watches the sky and let’s it drive his ambition. Luis Moreno Ocampo and Emmanuel Uwurukundo appear to be working the hardest for the cause. Ocampo, once an outspoken prosecutor of corruption in Argentina, continues the fight as a prosecutor for the International Criminal Court. He was elected unopposed as nobody wanted to take on such a tough position. It’s easy enough to see why when he is grilled by nations for taking on the duties of keeping the brutal dictators and warlords in check. In several interviews with the press, Ocampo is repeatedly asked if his actions will do any good. While Ocampo fight a legal battle, Emmanuel Uwurukundo was trying to provide aid for the refugee camps in Chad. He has a few terrorizing tales to tell about a region plagued by mass extermination where he fears for the lives of his family. He makes sure they’re safe, but continues the dangerous duties of helping those wronged and displaced by ignorance. All of these segments are divided up and strung together by watercolor illustrations. Simple shapes of people appear on the screen and chillingly disappear from the screen as the talks of death continue. It’s a beautiful method of illustrating the haunting nature of people once existing and then replaced by nothingness. It’s not the least bit surprising that the film won a Sundance award for its animated sequences. Also a worthy accolade was for the editing that takes a wealth of information parses at a perfect pace. This directorial decisions allows the viewer to take in the constant flow of genocide that never seems to stop or relegate itself to a few key incidents. Watchers of the Sky is one of the most important documentaries of the decade for presenting a never-ending crime that should not be ignored or downplayed. There is no clear indication that things will get better. All signs point to genocide becoming worse the way people refer to other races and religions as cockroaches rather than humans. There’s a loss of humanity that must be addressed and must be held accountable as the most serious of offenses. There is no happy ending to this film. It simply reiterates why more awareness and prosecution of genocide needs be given more attention and consideration. The battle must continue as lives must be saved. It is not easy or perhaps even notable work, but it is work that must be done for the good of mankind.